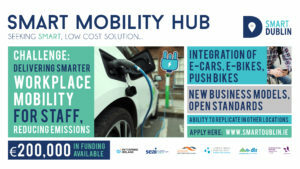 Dublin city council and SEAI (Sustainable Energy Authority of Ireland) are looking to test shared mobility options for staff through integration of e-cars, e-bikes and push bikes through the piloting of a smart mobility hub service solution. Any solution should also have the ability to be replicated at other DCC sites, public sector premises and also at private sector locations. “Dublin City Council, with the support of SEAI, are seeking innovative approaches and new business models to workplace mobility that can increase the use of cleaner vehicles for site visits and workplace meetings using shared e-bike and e-car schemes. This will help to reduce traffic congestion, air pollution and promotion of more sustainable outcomes” – Chris Garde, Smart City Planner, Dublin City Council. There was a briefing session for all prospective applicants in Dublin on the 15th of May. It provided the opportunity to discuss the requirements of the brief with Smart Dublin, Belfast City Council and Enterprise Ireland. See the presentations below.